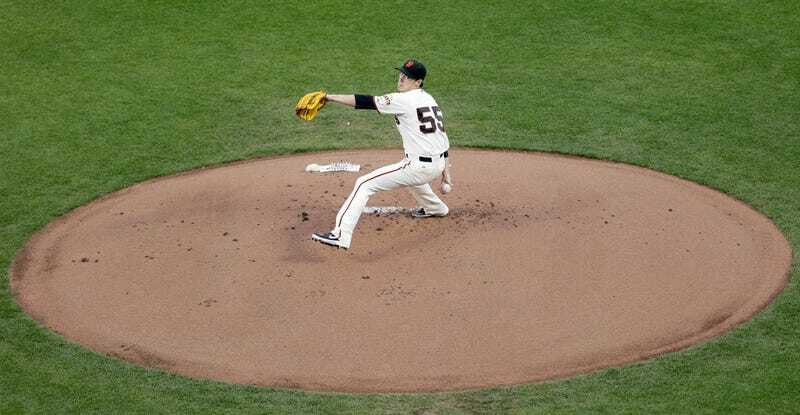 What Are The Giants Doing Giving Tim Lincecum $35 Million? He's 29 now, and the long hair is gone along with the velocity. A fastball that once kissed 95 now struggles to clear 90 mph. The ace of the staff for one championship run, he saw himself bumped to long relief for the next—and excelled. He's said he's willing to go to the bullpen if that's where the Giants want him. Is Tim Lincecum really worth $35 million for the next two years? He signed that deal coming off a 2010 season in which he posted a 2.74 ERA (127 ERA+) over 217 innings and finished sixth in the Cy Young voting. Over the last two seasons, Lincecum has posted a 4.76 ERA, which translates to a 72 ERA+ that is tied for the worst among major-league pitchers with 300 or more innings over those two seasons. The men he is tied with are Edinson Volquez, who was released by the Padres in August, and, in what should have been a giant red flag for Sabean, Barry Zito. It's a questionable signing, considering a qualifying offer would either have cost the Giants $14 million to get him for one more year, or reap a draft pick if he signed elsewhere for more. But it's a function of hope, of need, and of how the Giants do business. 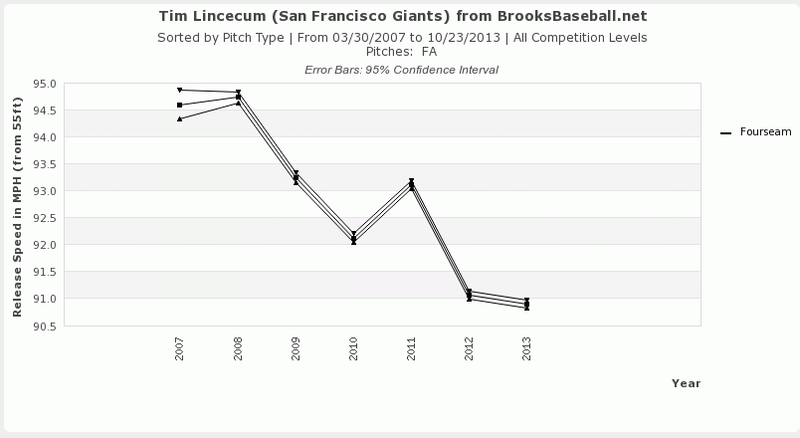 Lincecum's numbers this season were better than in 2012, if only slightly. It's part of what seems like an official transition from flamed-out fireballer to crafty veteran. He's still throwing his four-seamer more than anything else, but it's become a set-up pitch. In the past couple years he's phased out the sinking fastball and relied more on his slider and his splitter, and gets nearly 80 percent of his swings and misses on those two pitches. "I feel like I'm still trying to get a grasp on this new, I guess, me," he said. "I'm learning the hitters a little better and trying to be a little more efficient, studying them and exploiting them as much as I can. It's still a learning process. It's exciting just to look at it that way. This isn't just an end-all. This isn't as good as it's going to get. It's going to get a lot better." The Giants had better hope so, because they don't have many other options. Their rotation for next year consists of Matt Cain, Madison Bumgarner, and three question marks. They have a $6.5 million option on Ryan Vogelsong, who had an even worse year than Lincecum following two good ones, and Barry Zito will finally come off the books, though at the cost of a $7 million buyout. Lincecum is healthy, durable, and occasionally still capable of brilliance—see his 148-pitch no-hitter in July—just the sort of starter you'd want shoring up the back end of the rotation. The Bay Area writers are debating how much PR played a role in re-signing Lincecum, still one of the franchise's most popular players. But this goes beyond the individual to an organizational philosophy: the Giants re-sign their free agents. After 2010, they kept Pat Burrell, Aubrey Huff, and Guillermo Mota from hitting the open market. After the 2012 title, they locked up Marco Scutaro, Jeremy Affeldt, and Angel Pagan. And last month, they re-signed Hunter Pence, who's good but not great, to an eyebrow-raising five-year, $90 million deal. Brian Sabean said after the regular season that his top priorities were hanging on to Pence, Lincecum, and Javier Lopez. It's a tight free agent market, and they're all functional players that would be hard to replace without severely overpaying. So, his thinking goes, why not moderately overpay his own guys instead to avoid having to get sucked into bidding wars? It's a strategy that's found mixed success for San Francisco—they missed the playoffs both years following the World Series titles. (Two championships in three years is a "mixed success" any team would kill to achieve.) But if the Giants have money to spend, they could do a lot worse than overpaying the face of the team.